In most MMOs your predisposition to certain classes or occupations, starting village, physical appearance, and set of racial and regional traits are all determined by a single value – your character’s race. Furthermore, those values are all static and identical for every member of the race. In Chronicles of Elyria those values are dynamic and are determined by your choice of family. As discussed in last week’s design journal your predisposition for certain occupations is based on the occupations of your parents. Intuitively that makes sense. If you grow up in the household of a blacksmith and a carpenter, you’ll be handier with a hammer and chisel than say someone who grew up with two tailors. This predisposition manifests itself in-game as a set of starting skills. At the same time, your starting village is determined by where your family chooses to settle, not where your ancestors originated. So while travel is difficult, and many families will stay close to home, others may choose to branch out and explore, finally settling in far-off, distant lands. The combination of your parents’ occupations, your starting location, and your past life memories all work together to determine your character’s starting skills and early development. But your choice of family doesn’t just affect things generally associated with nurture - there’s plenty of nature in there as well! In this week’s design journal, we’re going to take a look at the final screen of character creation: “Character Customization” and talk about how your family selection impacts your physical appearance, inherited attributes, regional skills, and surnames. We’ll conclude this week’s journal by looking at how CoE enables character customization to extend beyond the character creation screen. Chronicles of Elyria uses a system of genetics that allows traits to be passed on from one generation to another. Like in our world, all living things have two sets of DNA, which are randomly sampled and used to determine the characteristics of their offspring. When talking about plants and animals, this allows players to create selective breeding programs, cross-pollinating and breeding until they get the outcome they’re looking for. When talking about player customization there's a bit more flexibility, but the idea is the same. As seen in Figures 1 and 3 there’s a collection of physical attributes that get passed on from parents to children that include hair, eye, and skin color, different facial features, height, and a range of other body attributes. On the left side of Figure 1 you can see values for “Mother” and “Father” which are randomly sampled from their genetic code. The right hand side of Figure 1 shows your ability to select specific values for your character’s traits. As indicated by the slider, you're constrained by the values passed on from both parents, along with some slight variation on the outer edge of some attributes. The constraints placed on a child’s physical appearance guarantees that family members closely resemble one another. This makes it so characters who hail from one region of the world will be easily identifiable by others. At the same time, noble Houses can become well-known for a specific set of physical traits, such as auburn hair and green eyes. Those traits initially proposed during character customization are randomly sampled from your character’s parents - however they can include mutations. This gives us a chance to introduce new attributes, colors, etc. into the gene pool and can result in unique combinations such red eyes and white hair (albinism). We understand that sometimes people don't want the random mutations (though they can be cool), and sometimes they don't like the initial set of values they were provided for their physical appearance. For that reason, players are given one re-roll to use during character customization. Rerolling your attributes takes another random sample from the parents in order to create a second set of constraints. Like it or not, if you re-roll, you're stuck with the second set of values. As Elyrians spread out across the map and settled in different locations they began to develop adaptations that made them more suited for their current environments. Those that settled in the dense forests were sheltered from the harsh rays of the sun. The constant climbing and the relentless noise of the jungle forced the inhabitants to become both strong and alert. In contrast, those that settled in the open deserts were frequently exposed to the harsh, unforgiving sun and had to survive long periods of time with little water. Large birds of prey didn’t differentiate between Mann and other food, and occupants of the world’s deserts were required to travel in and out of the open quickly. The slow process of evolution and the need to survive has created several different races across Elyria, each with their own set of resistances and starting attributes. Families whose ancestors were forest dwellers will begin the game with higher than average strength and intuition, while desert dwellers will begin with increased agility and stamina. With more than a dozen biomes in Elyria there’s a wide variety of starting attributes. And, unlike other MMOs, these racial differences are dynamic and will evolve as new families are created with parents from different bloodlines. You begin the game with a set of passive bonuses and skills that come from being raised in your specific environment. Grow up in the frozen north, the burning desert, a subterranean grotto, or in a bustling city and your character will start with a set of skills they’ve learned in order to survive. It should be noted that racial traits and regional traits are two sides of a coin. One dictates starting attributes, while the other dictates starting skills. Nature… and nurture. It should also be pointed out that family, racial bloodlines, and regional traits are the three important variables that represent what is generally referred to as “Race” in most MMOs. Together they define your predisposed occupations, starting attributes, and starting skills. And, aside from siblings, no other characters will come from the same family, in the same location, from the same bloodline as you, creating an unlimited number of starting combinations. When selecting a family you take over the life of one of their children. In order to maintain continuity, the lore establishes what’s called a “Naming Day”. That’s the day a character less than 18 years old chooses their new name - one that more closely describes who they are than the one they were born with. A player always takes over on their character’s Naming Day. While you can give yourself a new "given name" you are, for the time being, stuck with the Surname of your family. The family name indicates which House you’re from and which dynasty you're a part of. This is what affects your reputation and fame. 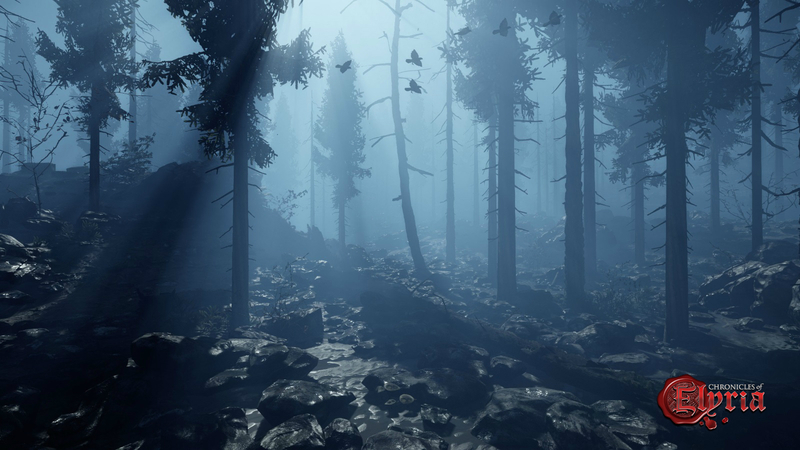 At server launch there will be dozens of Surnames used across the map, so there will be plenty of variety to choose from. Don't like the Surname you start with? That's ok too. As you play the game and complete achievements you'll unlock new Surnames. Surnames can be changed in some cases when developing a new village and in most cases when you've completed a server first or server-once achievement. For example, be the first person to slay a Daemon and henceforth your line may be known as House Daemonbane. There will be a complete set of crafting, adventuring, and humorous achievements solely for the purpose of allowing you to take on new Surnames. One other thing to note though, while your Surname may change, your Dynasty does not. Once a part of a Dynasty, always a part of that Dynasty. As we talked about in the last article, “Families & Family Selection”, Wards of the state are given more character customization in exchange for the benefits that come with being part of a family. As a result, their process of family selection and character customization is a bit different. First, after selecting the path of a Ward, you’ll be given the option to select which orphanage you’d like to join. Not all villages or towns have orphanages and the number of residents supported is based on the orphanages size. When selecting an orphanage you’ll have the ability to filter based on location, as well as which apprenticeships are available in that town. Your choice of orphanage will determine your starting location. Wards begin character customization by identifying which race or bloodline they’re a part of. This sets the basic parameters for physical appearance, as well as their starting attributes. While a ward isn’t constrained by any particular parents, they’re still constrained by the wider features of their race. Next, wards are able to use a point-buy system to set the skills they earned from birth to age 12. It’s as if, in the absence of parents, they followed their heart and learned whatever skills interested them. As with characters who are part of a family, wards receive the usual regional skills associated with growing up in their selected environment. 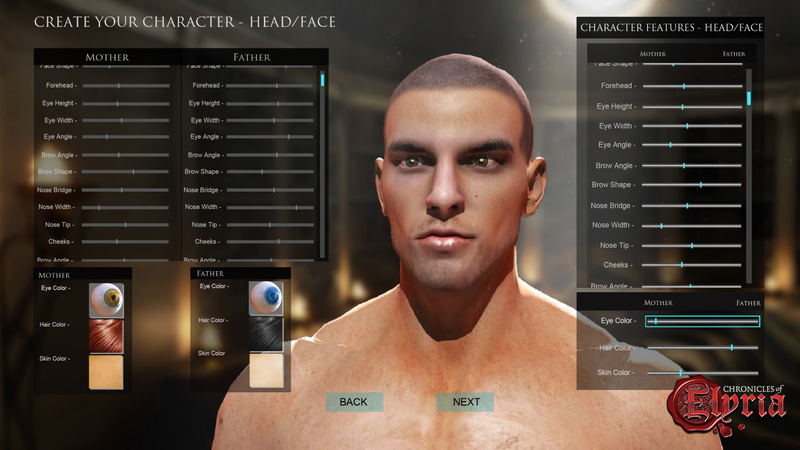 When looking at the character customization screens you may notice that aside from the fairly detailed facial features, we’re providing significantly fewer options for character customization than other MMOs. That’s because we feel character customization should be dynamic and be as much a function of how characters spend their time as what players select during character creation. 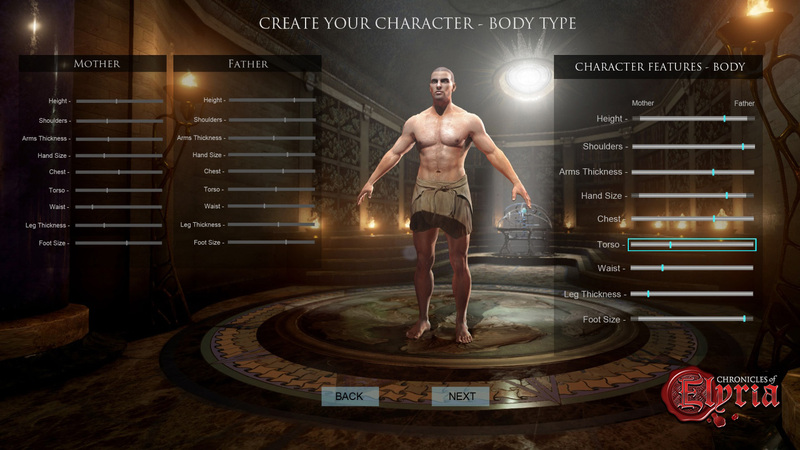 As a result, additional customization such as your character's girth or how muscular or frail looking they are is a function of how you play your character and will change over time. So if you play a warrior character, constantly out adventuring for long periods of time while facing dangerous enemies in physical combat, your character will look both lean and strong. On the other hand, if your character is a blacksmith, spending the majority of the day hammering at an anvil but otherwise stationary, they may look both strong and a bit on the portly side. Play a book worm, wandering bard, bartender or innkeeper and your character's appearance will match their occupations as well. Back in Design Journal #1 we saw a quote from character of lore, Anara Starsong that read: "… every soul is born with a purpose. That they choose the precise time and place in which to be born so they can learn the lessons needed to attain enlightenment." By selecting the combination of soul, birth date, and parents the player has fully laid out the type of character they're creating, and set themselves on a path of discovery, exploration, and story-telling that will last them the next 10-16 months. This design journal on character customization concludes our coverage on pre-game meta. In future design journals we'll begin focusing on what happens once your character enters the world! I don't know how well these threads here are being watched nowadays; Most of us are posting using the forum tab of this site. I find people there are usually pretty nice, maybe ask a question there? I don't know how well these threads here are being watched nowadays; Most of us are posting using the forum tab of this site. I find people there are usually pretty nice, maybe ask a question there? Can you help me put with a question? As you can see by my Forum name, Talvard Turnbull I'd hope that I can at some point use "Turnbull" as my surname. This is because I am ambitious, but I don't know how motivated I would be fighting for say the "Baker" family or "House Mavrick"
At some point in time I'd like to have/hear "House Turnbull" and a House Crest. Is there any options of obtaining such a thing? If you could reply in a PM I would be most greatful! Wonderful game your working on! Hello Caspian! Can you help me put with a question? As you can see by my Forum name, Talvard Turnbull I'd hope that I can at some point use "Turnbull" as my surname. This is because I am ambitious, but I don't know how motivated I would be fighting for say the "Baker" family or "House Mavrick" At some point in time I'd like to have/hear "House Turnbull" and a House Crest. Is there any options of obtaining such a thing? If you could reply in a PM I would be most greatful! Thankyou so much! P.S Wonderful game your working on! As you can see by my Forum name, Talvard Turnbull I'd hope that I can at some point use "Turnbull" as my surname. As long as you are at least Bloodline tier you will be able to choose the surname of yourself and your house. I'm sure as long as it isn't an offensive name it will be approved. Posted By **TarvaldTurnbull** at 07:37 AM - Wed Sep 28 2016 > > As you can see by my Forum name, Talvard Turnbull I'd hope that I can at some point use "Turnbull" as my surname. As long as you are at least Bloodline tier you will be able to choose the surname of yourself and your house. I'm sure as long as it isn't an offensive name it will be approved. I see you said there would be selective breeding. what would be the benefits of it be? Does different types of the same animal have different stats? Character creation was always one of the more intriguing aspects of yes to me....and now it's more interesting!!! The vast amount of content this game is offering is truly fantastic! I can certainly see why you will need to get the community involved for testing and I can't wait to get involved. Will it tell you before you confirm your selection what professions the family had? Random mutations!?! Someone was listening in biology class! I'm looking forward to immense surprises Elyria has in store. I got here through Facebook is this going to be playable through the app store or only through Facebook? I think all this customization will instantly make you immersed in the game and I'm just excited for everything to come, I think all this customization will be fun and extremely innovative. A sign of good to come! This looks so fantastic. Every new journal impresses me. I truly hope they keep it up. I've wanted so much more than what the other games have been offering. Something of more substance. I'm thinking, this just may be it. Thank you, for such an over all in depth creation of this game. Only just come across this and it is already ticking many boxes that I never knew I was waiting for!! Ok, I have one big question, which can be a big problem for me. I always use the surname of "ThunderStorm". How would I be able to do this in game? I am thinking via starting as a Ward of the state, but it is not clear from the above that this is the case. Caspian, if you read this, could you elaborate please? Thanks mate! Ok, I have one big question, which can be a big problem for me. I always use the surname of "ThunderStorm". How would I be able to do this in game? I am thinking via starting as a Ward of the state, but it is not clear from the above that this is the case. Caspian, if you read this, could you elaborate please? Thanks mate! Your best bet with a Surname like that is to earn some Influence before the game launches and then purchase a custom Surname. Beyond that, Surnames in-game are limited to Surnames we create and introduce into the world. There may be a few other options for creating custom surnames after launch, but in general... not so much. Hey Mate, Your best bet with a Surname like that is to earn some Influence before the game launches and then purchase a custom Surname. Beyond that, Surnames in-game are limited to Surnames we create and introduce into the world. There may be a few other options for creating custom surnames after launch, but in general... not so much. This Is What I Want In A Game Can't Wait For it!!! "...additional customization such as your character's girth or how muscular or frail looking they are is a function of how you play your character and will change over time." What a seemingly obvious yet apparently unprecedented device for creating truly unique characters. I'm so stoked. "...additional customization such as your character's girth or how muscular or frail looking they are is a function of how you play your character and will change over time." What a seemingly obvious yet apparently unprecedented device for creating truly unique characters. I'm so stoked.